Regularly $36 plus shipping. Now, through December 2018, get your copy for $20, includes free shipping within the U.S. 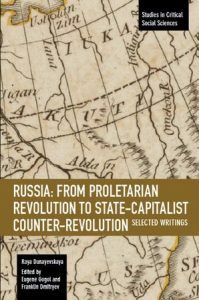 This entry was posted in Alerts & Appeals, Articles and tagged Eugene Gogol, Franklin Dmitryev, Raya Dunayevskaya, Russia: From Proletarian Revolution to State-Capitalist Counter-Revolution, Russian Revolution of 1917, state capitalism, Terry Moon. Bookmark the permalink.